Mexican Oregano (the plant pictured in the forefront above) has a lemony, oregano flavor that is a must in Mexican and Tex-Mex cooking. Unless you live in a frost free area, you will need to grow this as an annual. Thankfully it can grow to three feet or more in one year. We plant it each spring as soon as danger of frost has passed. It requires a very sunny location and quite a bit of space. It will spread to three or four feet wide. The leaves on the branches are far apart. This results in long stems with not many leaves. 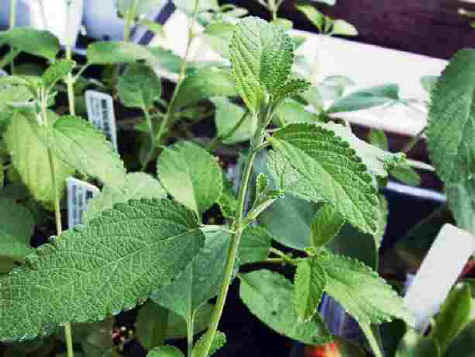 If you love this herb, you may want to plant two or three plants. As soon as frost is imminent, the entire plant is cut to the ground and the resulting bush is hung upside down in a cool dark place to dry. If humidity is an issue in your area, be sure to provide plenty of air circulation for your drying Mexican Oregano. Once completely dry it will crumble easily in your fingers. There are two ways to store it, on the stem or by removing the leaves and storing only the leaves. We take the plant down after it is dry and cut the stems to fit in large zippered bags. Be sure to cut the stems over clean paper so the debris from handling the dry stems can also be saved. The less you handle the herb the more the oils are retained for longer storage. 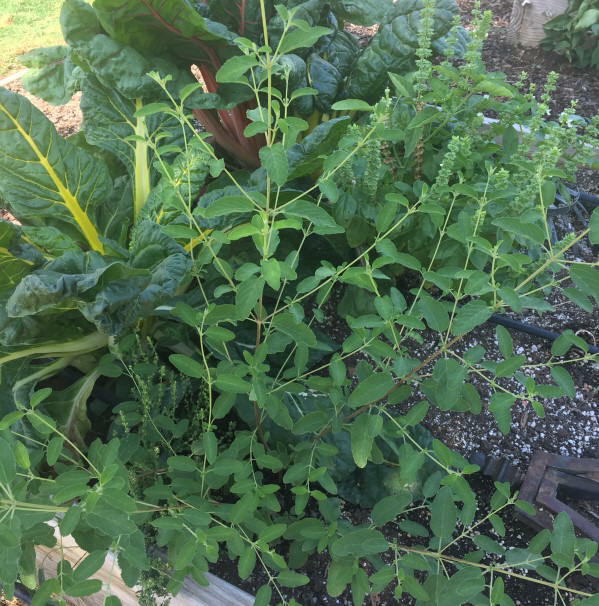 In case you are interested, the plants with the gorgeous red and gold veins behind the Mexican Oregano in the top picture are some of our Rainbow Swiss Chard. This plant is often available in plug trays. These trays hold 128 of all the same plant. They are a great low cost way to fill a lot of space. Each cell is 3/4 of inch by an inch. Check here to see if Mexican Oregano Plug Trays are available.